The Indonesian island of Sumatra was rocked by a powerful magnitude 7.8 earthquake yesterday, with tremors felt in neighbouring Singapore as well as up north in Malaysia. The epicentre of the quake, which struck at 7.49pm (8.49pm Singapore time), was detected about 808km off the coast of Padang, the capital of West Sumatra province, said the United States Geological Survey. Early reports of deaths as a result of the quake were refuted by Barsanas, Indonesia's search and rescue agency. Preliminary assessment by the country's national disaster management agency (BNPB) also indicated that a tsunami was unlikely. A tsunami alert issued soon after the quake had led to fear of a repeat of the magnitude 7.5 tremor and ensuing 4m-high waves that destroyed hundreds of homes in the Mentawai Islands, just off West Sumatra province, in 2010. More than 461 people died in that disaster, which came not long after a catastrophic 7.6 earthquake in Padang in 2009 which killed more than 1,100 people. 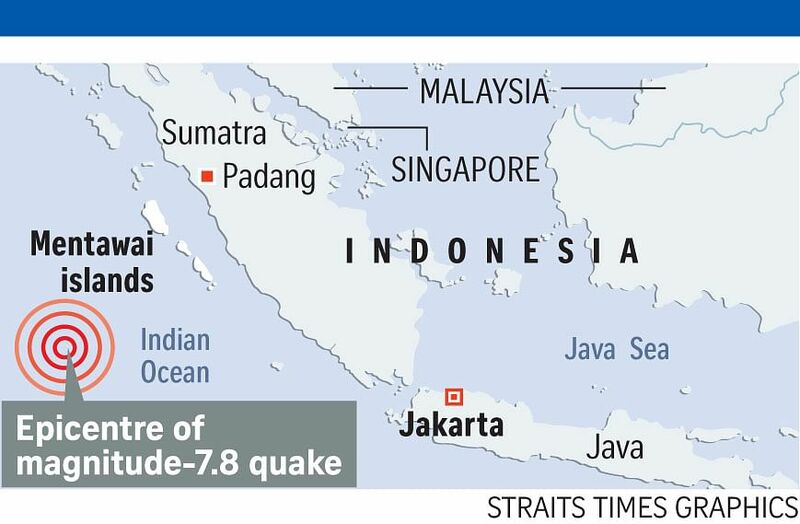 Yesterday's quake "is not of the type that would generate a huge tsunami", Dr Sutopo Purwo Nugroho, head of data and information at the BNPB, told The Straits Times. "Conditions in Sumatra remain safe, there no deaths but we will continue to try to gather more information from the field." But the agency has advised people to stay away from the beaches as a precaution. There were early signs of panic, with residents in Padang evacuating to higher ground when the quake was felt. Nightfall and the temporary disruption to telecommunications in the aftermath not only hampered rescue efforts, but also made it difficult for the authorities to assess the damage caused by the shallow quake. That mild tremors were felt as far as Shah Alam, Subang and Klang in Malaysia only added to the widespread panic. Some Singaporeans living in Jurong and Punggol also felt the tremors, which they said lasted for a few seconds. Mr Mohamed Nasrullah, 29, who lives in Jurong, said he felt the tremors twice at around 8.50pm. "My bed was moving for two to three seconds each time, and I saw my water bottle shaking, too," said the quality assurance and control painting inspector. Geology experts have long said that a geological time bomb is ticking in Indonesia, and the city of Padang sits near it. In the last decade, five major quakes, including the catastrophic 2004 Boxing Day tsunami, have struck the city, giving it the dubious distinction of being the earthquake capital of the world. Similarly, findings published two years ago also found that coastal communities such as Padang, traditionally believed to be shielded from waves by offshore islands, may be at higher risk of tsunamis. •Additional reporting by Wahyudi Soeriaatmadja, Arlina Arshad, Amelia Teng and Eunice Au.